Photo courtesy of Deep Blue Media, Lake Balaton, Hungary. Ferry Weertman of the Netherlands was named Swimming World Magazine's 2017 Open Water Male Swimmer of the Year for his close victory over Jordan Wilimovsky in Lake Balaton at the 2017 FINA World Swimming Championships 10 km race in Hungary. Weertman was also nominated for the 2017 World Open Water Swimming Man of the Year. 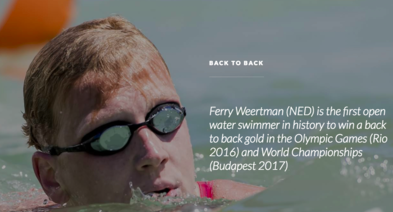 His WOWSA Award nomination reads, Ferry Weertman defended his 2016 Olympic 10K Marathon Swimming gold medal with a dramatic, close victory at the 2017 FINA World Championships in Hungary. These back-to-back performances demonstrated the intensity and passion that the 25-year-old Dutchman has for swimming. He has both speed and stamina in abundance based on a massive amount of training mileage in the pool and open water. He not only has the drive to realize his athletic dreams, but he also has the personality to represent the sport in a responsible manner befitting modern-day heroes. With a giant target on his back, Weertman won the 10 km world championship by 0.1 seconds with another ferocious sprint to the finish. For his competitive spirit and composure under pressure in the highest levels of competition, for continuing to win despite swimming with a giant target on his back, for his genuinely engaging personality in casually addressing questions from the media and fans, Ferry Weertman is a worthy nominee for the 2017 World Open Water Swimming Man of the Year. Aurélie Muller was named Swimming World Magazine's 2017 Open Water Female Swimmer of the Year.